Each trip to Phan Rang gives visitors a new experience and brought them to new cool places of this coastal central city of Ninh Thuan Province. I have visited Phan Rang several times but each trip gave me a new experience and brought me to new cool places of this coastal central city of Ninh Thuan Province. People who love to swim in the sea, to bathe in a stream, to trek to a mountain, to explore a forest can find all these things in this ideal destination. 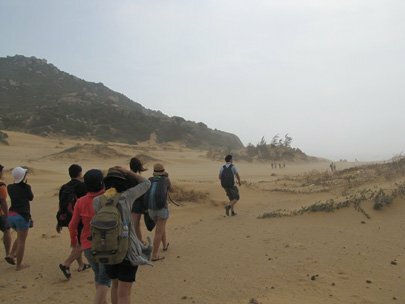 Apart from popular destinations in Ninh Thuan such as Vinh Hy Bay, Ca Na and Binh Tien beaches, Poklong Garai Tower, Bau Truc Pottery Village and My Nghiep Brocade Village, tourists are advised to visit Nam Cuong sand dunes, Hanging Lake on Nui Chua National Park, Mui Dinh Lighthouse, Chapor Waterfall, fossilized coral reef and Rai Cave. To get to Phan Rang, which is about 330km away from HCMC, tourists can either take a train or bus/car. The best option is a two-way journey in an air-conditioned train to Thap Cham Railway Station in Phan Rang which costs VND900,000. The first destination should be the red Nam Cuong sand dunes in Tuan Tu Culture Village in Ninh Phuoc District’s An Hai Commune. The 700 hectare Nam Cuong sand dunes amazingly shine in different color tones depending on the sunlight. The perfect time to admire the sand dunes is at sunrise when the first rays of the sun from the horizon reflect its light onto the place and gradually spread its light. 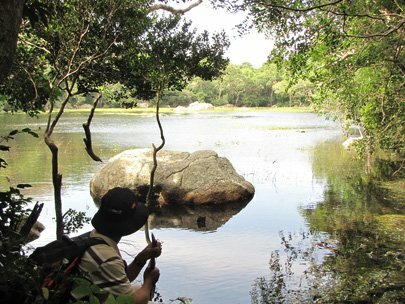 Tourists can then visit Nui Chua National Park in Ninh Hai District which is 7km from Phan Rang-Thap Cham City at around 8 a.m. or 9 a.m. to avoid the heat and humidity. The park has a unique semi-arid flora and fauna, sea turtle nesting beaches, protected prehistoric coral reef which faces the sea. Some might think that its surface looks like Mars as there are a lot of holes in different shapes and depth. Especially, tourists cannot imagine that there’s a Hanging Lake on the peak of the park which is full of water from streams and underground springs in the area all-year round. The diameter of the lake is 80 meters. Its water is blue, and, especially in rainy months, the lake amidst the immense forest creates a beautifully proportioned picture. The next day you can discover Chapor waterfall which is located in Ma Lam Hamlet in Phuoc Tan Commune of Bac Ai District and is 60km from Phan Rang City. This is a natural waterfall and stream and falls down from a height of 50m to the ponds below. Tourists can freely relax on the pure and cool water of the stream below the waterfall or find a flat rock under a shade to enjoy a meal or take a snap in a very quite and peaceful space. Mui Dinh (Dinh Cape) in Son Hai Village in Phuoc Dinh Commune which is 40km south of Phan Rang City and 10 km from the popular Ca Na beach is the perfect ending to your trip. However, this is not an ideal place for those who are not physically strong as you have to pass a sand dune in strong winds. The wind power can extinguish even a brave tourist’s will. 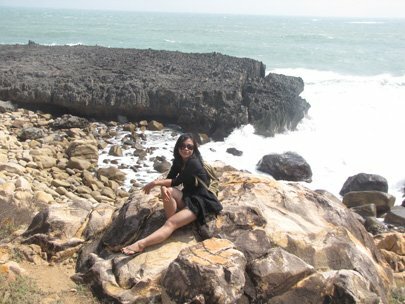 If you can pass it, you are treated to a fantastic landscape of primitive, beautiful, white sand beach with rock cliffs at the foot of Dinh Mountain and a romantic lighthouse on the peak. Tourists can buy friends and relatives some Ninh Thuan souvenirs like fish sauce, garlic and products made from grape. As for local specialties, banh can (a cake made from rice flour served with seafood) and banh canh (rice noodles with fish paste) are a must.